Classes and Objects are considered to be the most useful and dynamic aspects of a programming language. In PHP, classes are used extensively and are very useful. The concept of classes allows for better performance and more features. The Class in PHP is basically the same as in other languages such as Java. The class definition begins with the keyword class, followed by a class name. The form name can be any name except a reserved word or keyword in PHP. The class name is followed by a pair of curly braces which contain the definition of class members and methods. An Object is an enclosed bundle of variables and functions which is copied from a Class. Objects provide an easy interface and hide a lot of their inner workings. The object sends orders through special functions called methods and they can return information. While creating a Class, a set of characteristics is laid down. By creating Objects of that type, entities are created that share these characteristics but the Object might initialize them as different values. Suppose there is a class named building. This class would have a characteristic named floor. All the objects of class building would share the characteristics of floor, but some would initialize it to “one”, some to “two”, others to “three” or “four”, and so on. The benefit of object oriented code is that it is re-useable. In this the classes can be used to create different objects and classes from one project can be used in other projects as well. Child classes can also be created which inherits the properties of the parent classes. To start with, a class having no member functions and variables is not useful. For a class to be completely useful, member functions and variables have to be added in that class. Let’s take an example of a class with a variable in it. The class abc is the basis from which many objects can be instantiated. The new keyword is used to create an object. Now any abc object that is created contains a property called $a with the value of “Hello”. This property can be accessed and even be changed with the help of objects. In this the -> operator is used to access or change the properties of the object. In the following example $obj1 and $obj2 are the objects of the class abc. In this $obj2 has been assigned the string “Welcome to expertrating!” to its $a property. Another feature of object oriented programming is used in PHP, which is inheritance. In PHP a class a class can inherit methods, functions and members of other class by using the extends keyword in the declaration. In PHP it is not possible to inherit from multiple classes, a class can inherit from only one base class. The class from which inheritance is done is called the parent class or base class and the class which inherits is called the child class. The final keyword prevents the child classes from overriding a method. This can be done by prefixing the method with the keyword final. If the complete class is being defined as final then that class cannot be extended. The class defined above i.e. class test cannot be overloaded as it has been finalized by using the keyword final with it. A new concept of abstract classes and methods has been introduced in PHP5. When a class is defined as abstract then it is not allowed to create the instance of that class. A class that contains at least one abstract method must also be abstract. The methods defined as abstract cannot define the implementation; they just declare the method’s signature. When a child class is inheriting from an abstract parent class, then all the methods marked abstract in parent class declaration must also be additionally defined by the child class. These methods must be defined with the same or weaker access. This means that if an abstract method is declared as protected in the parent class then it must be declared either as protected or public in the child class. When class members or methods are declared as static then there is no need to instantiate that class. These members and methods are accessible without the instantiation of the class. If a member is declared as static then it cannot be accessed by an instantiated class object, but a method declared as static can be accessed by an instantiated class object. The static declaration of a class must be after the visibility declaration (means that after the member or method has been declared as public, protected, or private). The static method calls are resolved at compile time and static properties cannot be accessed through the object through the arrow operator (->). Object interfaces allow the creation of a code which specifies that which method a class must implement, without having to define how these methods have to be handled. Interfaces are defined in the same way as a class is defined. These interfaces are defined with the keyword “interface”. In the interface the contents of the methods do not have to be defined and all the methods declared in the interface must be declared as public. To implement an interface, the implements operator is used. The methods must be defined before implementation and all the methods in the interface must be implemented within a class. 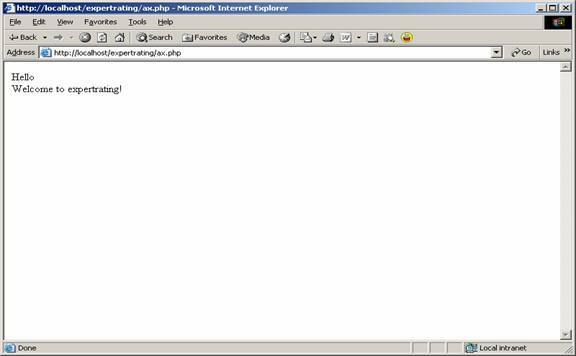 Exception handling in PHP is similar to that of other programming languages. Within a PHP block of code we can throw, try and catch an exception. There must be at least one catch block in a try block. In this multiple catch blocks can be used to catch different class types. In exception handling the execution will continue after the last catch block has been encountered and exceptions can be thrown within catch blocks. In exception handling when an exception is thrown, the code following the statement will not be executed rather PHP will attempt to find the first matching catch block. If the exception is not caught then it will result in a fatal error with an uncaught exception message.